This is one of the best cards I’ve ever pulled. Usually, I tend to buy low-end boxes, so the game-used or autographs I get don’t tend to be anything grand. Such as, I recently bought a 2007 Upper Deck box and got a Ben Sheets jersey card. Really, there isn’t any Brewers GU I want, but if I were to pick, it would have been Prince Fielder. However, it was Ben Sheets. 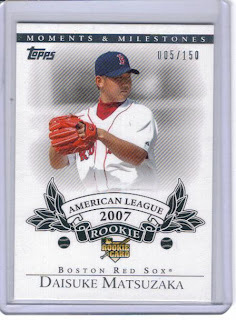 The Daisuke Matsuzaka card wasn’t even a game-used or anything. Just a rookie. Well, not just any rookie. He has plenty of experience in Japan and the Red Sox paid an awful lot of money for him. So, what did I do with my brand new card? I sold it for $200. Got double the money I paid for the box of 2007 Topps Moments and Milestones and put that money toward cards I want to collect. Yes, I only paid $100 for the box. A great price. Today I went to the local over-priced card shop. I have never bought a single baseball card from this store. They were selling the wax boxes for $190. I think I made out well. I actually just stumbled on to your blog for the first time. It's funny how the hobby changes so quickly. The prices paid for boxes of Milestones, and the selling price of that dice-k just seem absolutely insane only 1 1/2 years after you wrote these posts. I can't believe a shop was selling boxes for $190. I hope nobody bought any. It's funny to look back.